Rain, rain, rain — we’ve had nothing but for the last week, some of it pretty hard. I should have run Wildwood today, but I couldn’t face the mud. 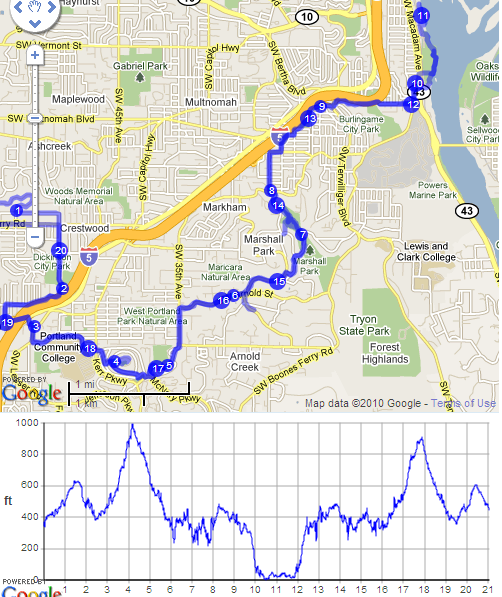 Instead, I ran around SW Portland, up and down the hilliest routes I could find. At least it didn’t rain much while I was actually out there. I took this 21-miler nice and slow, and had no problems along the way. Halfway through I stopped into a store to buy a bag of potato chips. Mmmmm chips. There was a small amount of trail-running along the way, including a nice section through Marshall Park, which I’d never seen before. There was a good — and confusing — trail network throughout the woods in this park, crossing pretty creeks and switchbacking up steep hillsides. There was also a playground seemingly in the middle of the woods… though I think there was street access close by. A creek-side trail in Marshall Park. That’s 48.8 miles for the week so far. Tomorrow I’ll take a recovery jog to make it an even 50, my first ever 50-mile week. With 182.7 miles to date, May is now my all-time highest-mileage month as well. 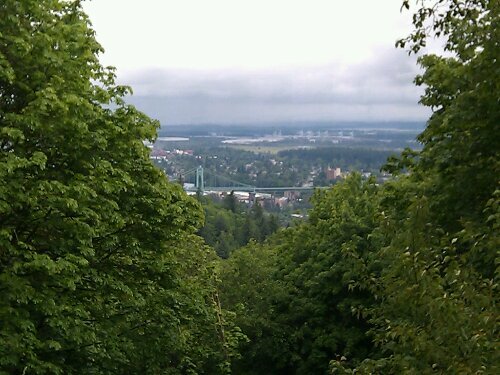 I’ve registered for the Timberline Marathon, which is on June 5th, less than two weeks away. I’m going to be doing it as a training run, not a race. It starts and finishes in the same place as the Mount Hood PCT 50, and shares some of the same trails, so it should be excellent practice. I’m not sure whether to feel pride, fear, or loathing that I’ve reached the point where I think I can run a marathon just for training. My energy levels have been sagging the last few days. I don’t know whether it’s from my increased mileage, a little bit of a cold, allergies, or just our crummy rainy dark cold weather this Spring. Other than the general fatigue, all my body parts are feeling pretty good. My worst recent complaint is a small but painful blister on the right top side of my left index toe. I also have a some tightness in my right calf that I’ve been keeping an eye on. I’m still planning for this week to be my big first-ever 50-mile week. The eighteen miles was easy enough. I deliberately didn’t eat anything along the way, hoping to get some extra endocrine-system training in and make me a more efficient fat-burner. Even so, I didn’t feel bonky toward the end. I drank some homemade sports drink which Sweetie and I concocted from water, lemon and lime juice, sugar, and opened-up salt capsules. (These salt capsules have other mineral salts and electrolytes besides just good old sodium chloride.) It worked really well. Taking it easy, I did the out-and-back in 2:41, which is a nine-minutes-per-mile average pace. I’m running six days a week now, which part of me thinks is just plain crazy. What do I think I am, a real runner or something? Last week, I logged 41 miles, with a long run of just 12. This week I’m aiming for 45, with an 18-mile long run. I allow myself one faster run on Mondays and the rest of the week take it pretty easy. On the weekends I run on trails, and during the week I try to do streets with lots of hills. The problem with my right ankle has gone away and the left knee is feeling good for the most part. I’ve run six days in a row now, which might be a record. I can’t remember. They were all pretty easy runs, and the longest was eight miles, so I don’t think I’m doing my recovery much damage… though I am starting to feel a little worse for wear. My back, tweaked lifting bags of rocks during the weekend, is still a little sore at times. My right ankle has been hurting a little since the marathon and I’m starting to worry that maybe it is getting worse, not better. Well, tomorrow’s a rest day. I had better rest as hard as I can. Meanwhile, did you know that the World 24-hour run championships are being held right now? They are 15 hours into it as I write. Live leaderboard. American Scott Jurek is in second; he’s said he wants to break the American 24-hour record, which I think is 162 miles. New York Times food write Mark Bittman did an interesting piece on Jurek, who is a vegan. I guess Bittman runs a bit, too. 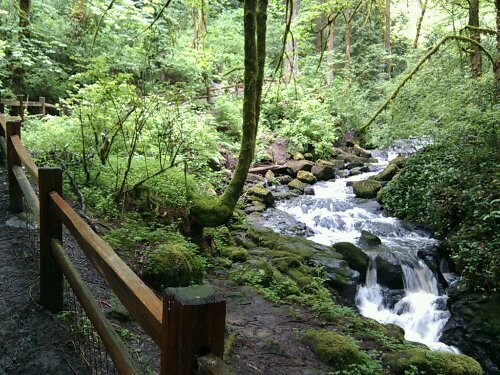 Saturday I ran eight miles in Forest Park, on Wildwood Trail. (Mileposts 9.25 to 11 to 7 to 9.25). My legs felt recovered but, as is usual at this stage post-marathon, the rest of me was not entirely there yet. I was going nice and slow, but it still felt like a lot of work. It also seemed to take forever. Maybe my mind just wasn’t in it; Saturday was my 40th birthday. I wouldn’t have thought I would, but I ended up dwelling on that some. That night I absolutely gorged myself on pizza from Apizza Scholls, which, let me once again plug, is the best pizza in the world. Or at least somewhere in the top 10. I crammed slice after slice down my gullet, washing it down with wine, cocktails, and chocolate mousse pie. I regret nothing. After a long day of yard and patio work Sunday, I went for an easy four-mile run in my neighborhood hills. Other than getting pretty hot and sweaty, that one went fine. I am planning on adding Sunday as a regular running day now and running six out of seven days as I work my way up to fifty mile weeks. You are currently browsing the I'd Rather be Running blog archives for May, 2010.